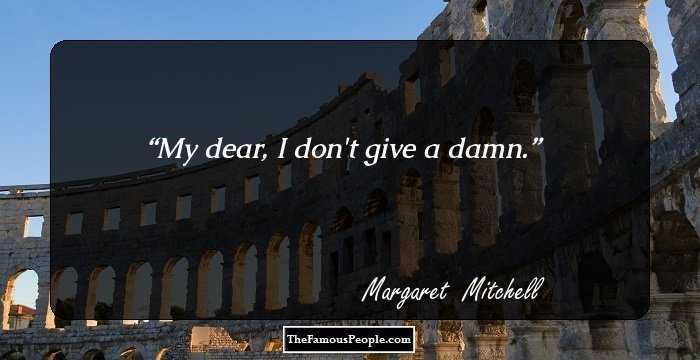 A collection of quotes by Margaret Mitchell on books, children, desire, literature, memories, hope, war etc. 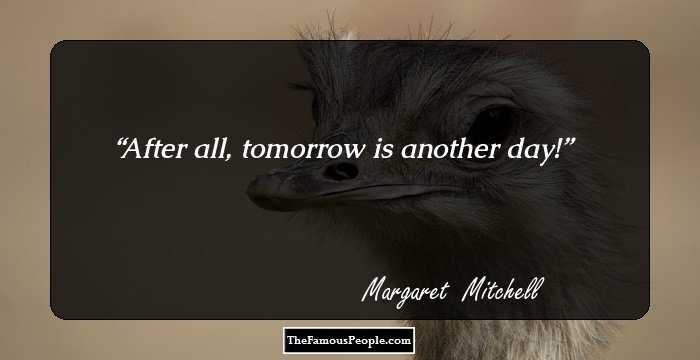 Margaret Mitchell, who published under the name of Peggy Mitchell, was a renowned American author and journalist, most famous for her work ‘Gone with the wind’. This novel was based on American Civil war period for which she was awarded the esteemed Pulitzer Prize for fiction. 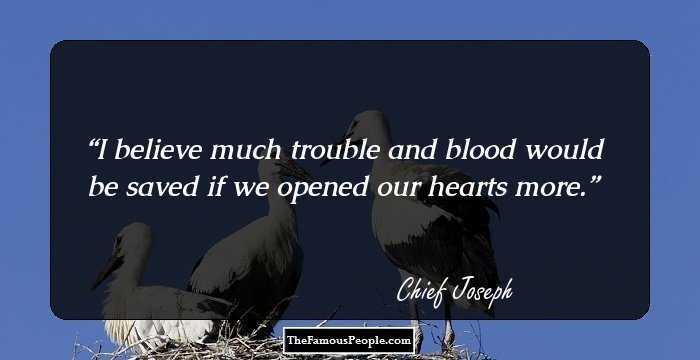 History is witness to wars that have taken millions of lives and with her masterpiece (Gone with the wind) she tried to convey the sufferings that common people faced due to war. Through her masterpiece she certainly left behind a legacy that highlights the negative impacts of war. 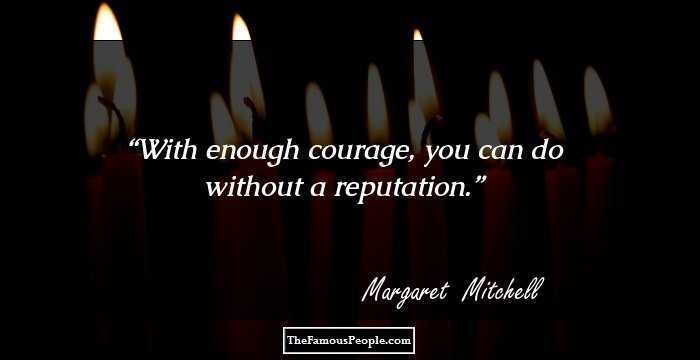 We have curated some of Margaret Mitchell’s most famous quotes from her writings and observations. 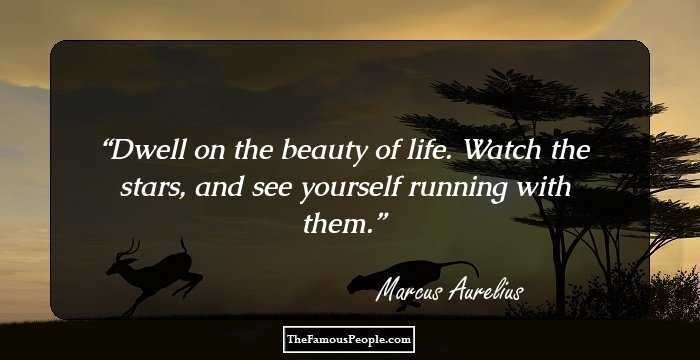 Read these quotes from one of the greatest novelist to have lived in the history of English Literature. 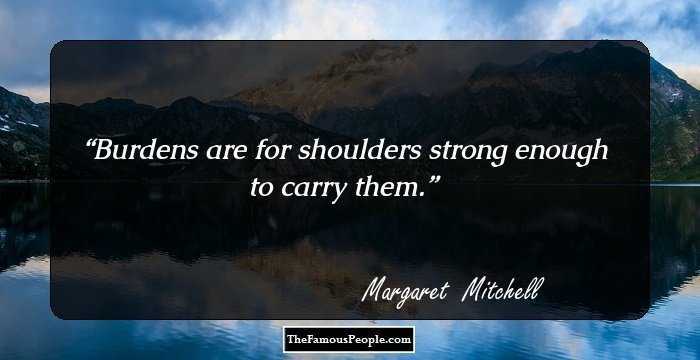 Burdens are for shoulders strong enough to carry them. 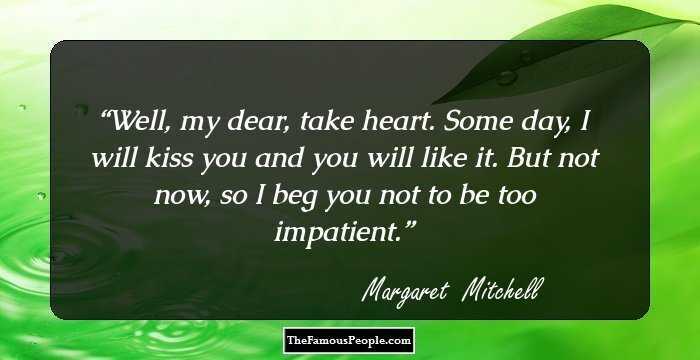 Well, my dear, take heart. Some day, I will kiss you and you will like it. But not now, so I beg you not to be too impatient. I'll think of it tomorrow, at Tara. I can stand it then. Tomorrow, I'll think of some way to get him back. 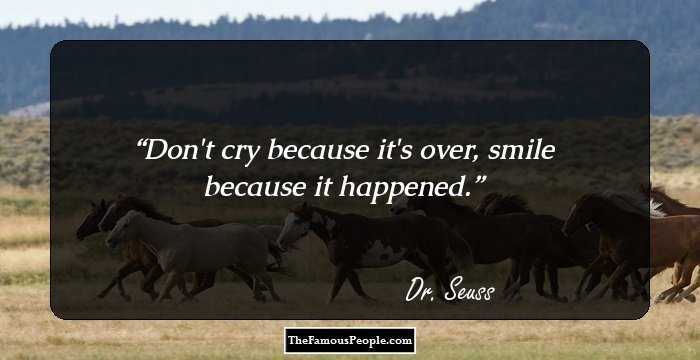 After all, tomorrow is another day. Sir,"she said,"you are no gentleman!" An apt observation,"he answered airily. "And, you, Miss, are no lady. Perhaps - I want the old days back again and they'll never come back, and I am haunted by the memory of them and of the world falling about my ears. It was better to know the worst than to wonder. I'd cut up my heart for you to wear if you wanted it. You're so brutal to those who love you, Scarlett. You take their love and hold it over their heads like a whip. If I said I was madly in love with you you'd know I was lying. 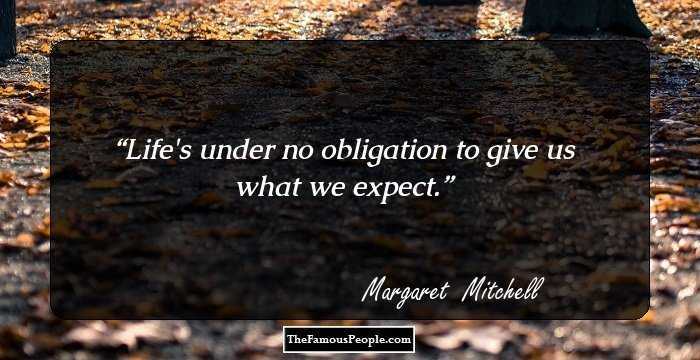 Life's under no obligation to give us what we expect. We take what we get and are thankful it's no worse than it is. And apologies, once postponed, become harder and harder to make, and finally impossible. Vanity was stronger than love at sixteen and there was no room in her hot heart now for anything but hate. That is the one unforgivable sin in any society. 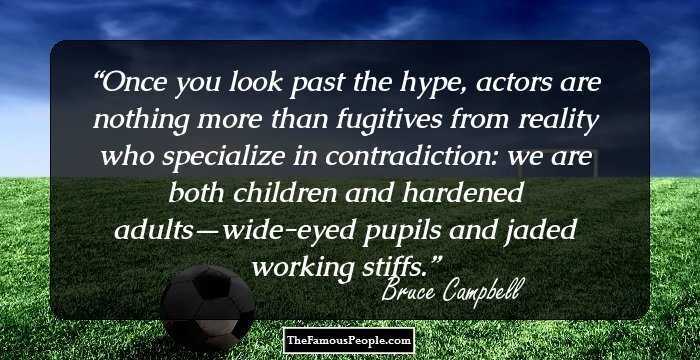 Be different and be damned! 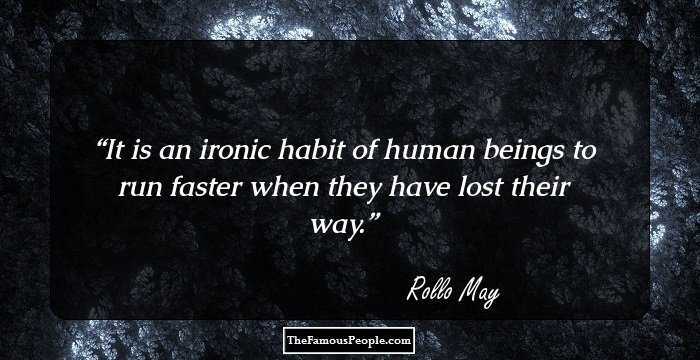 I've always had a weakness for lost causes once they're really lost. I wish I could care what you do or where you go but I can't... My dear, I don't give a damn. Great balls of fire. Don't bother me anymore, and don't call me sugar. Now she had a fumbling knowledge that, had she ever understood Ashley, she would never have loved him; had she ever understood Rhett, she would never have lost him. The land is the only thing in the world worth working for, worth fighting for, worth dying for, because it's the only thing that lasts".....Gerald O'Hara, Gone With The Wind. It was not often that she was alone like this and she did not like it. When she was alone she had to think and, these days, thoughts were not so pleasant. Longing hearts could only stand so much longing. I only know that I love you. That's your misfortune. Now you are beginning to think for yourself instead of letting others think for you. That’s the beginning of wisdom. 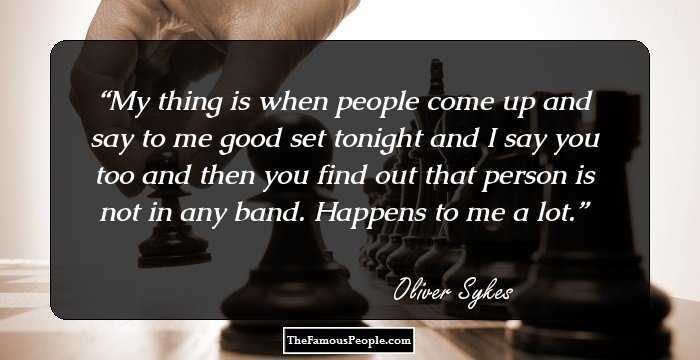 I wonder if anyone but me realizes what goes on in that head back of your deceptively sweet face. How closely women clutch the very chains that bind them! He had never known such gallantry as the gallantry of Scarlett O'Hara going forth to conquer the world in her mother's velvet curtains and the tail feathers of a rooster. Men and women, they were beautiful and wild, all a little violent under their pleasant ways and only a little tamed. Scarlett, always save something to fear—even as you save something to love. Babies, babies, babies. Why did God make so many babies? But no, God didn't make them. Stupid people made them. If he's forgotten me, I'll make him remember me. I'll make him want me again. Hush," he said. "I am asking you to marry me. Would you be convinced if I knelt down? She saw in his eyes defeat of her wild dreams, her mad desires. Yes, I want money more than anything else in the world.” “Then you’ve made the only choice. But there’s a penalty attached, as there is to most things you want. It’s loneliness. She hasn't your strength. She's never had any strength. She's never had anything but heart. God help the man who ever really loves you. Her burdens were her own and burdens were for shoulders strong enough to bear them. The way to get a man interested and to hold his interest was to talk about himself, and then gradually lead the conversation around yourself—and keep it there. There’ll always be wars because men love wars. Women don’t, but men do.. In the end what will happen will be what has happened whenever a civilization breaks up. The people who have brains and courage come through and the ones who haven't are winnowed out. Like most girls, her imagination carried her just as far as the altar and no further. The whole world can't lick us but we can lick ourselves by longing too hard for things we haven't got any more - and by remembering too much. I'm tempting you with fine gifts until your girlish ideals are quite worn away and you are at my mercy. All she wanted was a breathing space in which to hurt. He made her play and she had almost forgotten how. Life had been so serious and so bitter. He knew how to play and swept her along with him. All really nice girls wonder when men don't try to kiss them. They know they shouldn't want them to and they know they must act insulted if they do, but just the same, they wish the men would try. You have eternity in which to explain and only one night to be a martyr in the amphitheater Get out, darling, and let me see the lions eat you. I'm riding you with a slack rein, my pet, but don't forget that I'm riding with curb and spurs just the same. Take my handkerchief, Scarlett. Never, at any crisis of your life, have I known you to have a handkerchief. But she knew that no matter what beauty lay behind, it must remain there. No one could go forward with a load of aching memories. It's not because I've -what is the phrase? -'swept you off your feet' by my -er- ardor? It had been so long since she had seen him and she had lived on memories until they were worn thin. She couldn't survey the wreck of the world with an air of casual unconcern. [Yankees] are pretty much like southerners except with worse manners, of course, and terrible accents. Anyone as selfish and determined as you are is never helpless. You should be kissed and often, by someone who knows how. They knew that love snatched in the face of danger and death was doubly sweet for the strange excitement that went with it. Somehow the bright beauty had gone from April afternoon and from her heart as well and the sad sweetness of remembering was as bitter as gall. His voice stopped and they looked for a long quiet moment into each other's eyes and between them lay the sunny lost youth that they had so unthinkingly shared. Then you've made the only choice. But there's a penalty attached, as there is to most things you want. It's loneliness. She was as forthright and simple as the winds that blew over Tara and the yellow river that wound around it. But, Scarlett, did it ever occur to you that even the most deathless love could wear out? Land is the only thing in the world that amounts to anything. The green eyes in the carefully sweet face were turbulent, willful, lusty with life, distinctly at variance with her decorous demeanor. Her manners had been imposed upon her ... her eyes were her own. To Scarlett, there was something breath-taking about Ellen O'Hara, a miracle that lived in the house with her and awed her and charmed and soothed her. Crackers are short on sparkle. I was right when I said I’d never look back. It hurts too much, it drags at your heart till you can’t ever do anything else except look back. I won't need you to rescue meM. I can take care of myself, thank you. - Scarlett O'Hara. 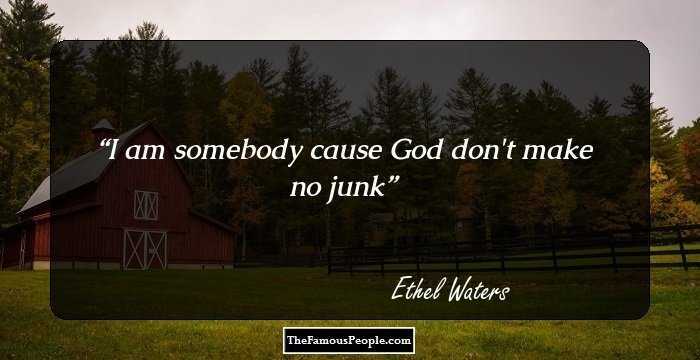 70 Ethel Waters Quotes on Joy, Positivity, Emotions, Time Etc. 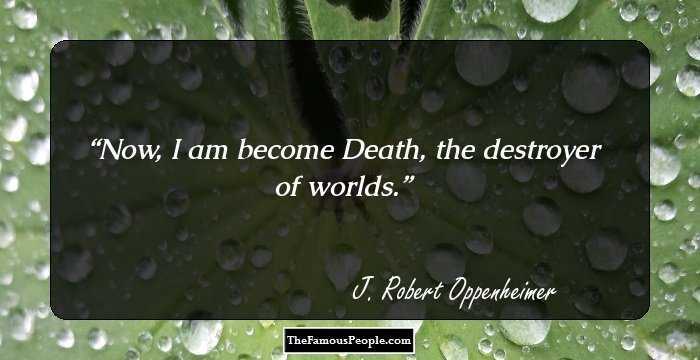 14 Top Quotes by J. Robert Oppenheimer, The founding father of the American School of Theoretical Physics.